The Gibbon Gutter Cleaner is equipped with specially-designed "gutter edge" wheels that hook onto the gutter's edge, allowing it to glide smoothly - even over support struts. 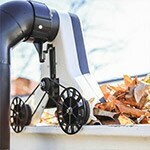 The wheels easily hook onto the gutter and roll as the forced air from the leaf blower propels it along, blowing debris up and out of the gutter. The wheels make for easy change of direction as well. By swinging your leaf blower and attachment in the opposite direction, the Gibbon Gutter Cleaner is easily triggered to reverse direction while maintaining balance and blowing the opposite direction for continuous cleaning. Without extensions, the Gibbon Gutter Cleaner can easily reach most single-story gutters, and will clean 20 feet of gutters in only 60 seconds. However, with an gutter cleaner extension kit (sold separately), you can extend your reach to accommodate higher gutters. You can effectively use up to 2 extension kits for an additional 12 feet of reach to clean out second-story gutters more safely. The large diameter pipe allows optimal air flow and minimizes friction loss, so you're still getting the powerful burst of air to move wet leaves from where they don't belong. 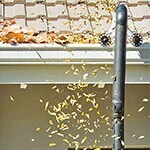 These convenient gutter cleaning systems don't work with all leaf blowers, but are compatible with many. Knowing what's required is important to achieving optimal performance. 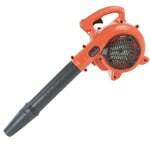 So be sure that the leaf blower you're using this with has at least 260 CFM (that's cubic feet per minute) of air flow and an outlet pipe diameter between 2.5" and 3.3". These compatibility requirements are commonly found in gas-powered leaf blowers, but can be found in select electric leaf blowers. Gibbon's Easy Gutter Cleaning.. Our Power Equipment Direct how-to library can help you learn about Shindaiwa Leaf Blowers, Proposition 65 Product Labeling and Sales Tax Information.